Primark‘s making headlines during the start of this New Year, with multiple store opening announcements, including one in Bath just days ago, with a few more in the works to appear in the sopping world throughout 2015. The Irish retailer that goes by the name Pennys in Ireland is the budget clothing store that attracts the fashion fans without much cash flow. The store first opened its doors on Mary Street in Dublin in 1969, quickly adding to its chain until it became the ever expanding success story it is today. Selling fashionable clothes at a low cost really gained it its popularity, so much so that the Primark name is known in Austria, Belgium, France, Germany, Portugal, Spain, the Netherlands and the UK as well. Soon, the United States will also be able to enjoy all that the company has to offer. This year bodes well for the brand and the Primark spring/summer 2015 collection has been released just in time for many to begin stocking up for the warmer seasons. Since the hustle and bustle of Christmas and the New Year celebrations are over, we are all longing for brighter days with sunshine and Vitamin D. Of course, that would require warm enough weather to afford the shedding of the jackets and sweaters, replacing them with sweet, flirty dresses and showing off some skin as we try to fix our tans and rid ourselves of our pasty winter looks. As such, Primark has ensured this spring and summer we will be enjoying our days in a fashionably young manner, giving its collection a fun and flirty flair. A 2012 Valentino yellow dress now appears in its cloned version for Primark, while vintage lace and crop tops adorn the racks with their classical white nuclear colors and trends that refuse to leave the runway yet. Budget accessories that emulate top designs also appear within the collection, sprucing up the outfits with their sweet lavender chains and fun polka dotted handbags. Crop top and skirt twinsets are all the rage and Primark isn’t one to back down from the challenge of creating something that’s both fashionable and unique, which is where this green and black leafy print set comes into play. The round glasses are totally vintage and entirely too out of place, so much so that we are beginning to love them. The blue tint to the lipstick though? We might have a problem with that. We’ll be waiting to see who actually becomes the trendsetter for this one. The ’90s are back! Or maybe it’s the ’80s? Perhaps the ’70s‚Äö√Ñ√∂‚àö√ë¬¨‚àÇ. or possibly the ’60s. That look has it all really, complete with the bright white coloring, the crop top, large and loose pants that sit on the waist and show off the belly button, the platform open toes that do little to promote femininity and the sleeveless matching jacket that is as wildly adorable as the rest of it. Paired with a thick white link necklace and we have a lovely beach worthy look that has made it into Primark but might be a little confused on which century it’s from. Last year’s denim on denim looks are still here and still as strikingly lovely. Just pair the denim shorts with a denim jacket and add a bright yellow tank top underneath while finishing off with flower power flats wit slight platforms. That lipstick is 2 decades past its prime though so we’ll once again be waiting for trendsetters that go for lip pencils 3 shades darker than the lipstick or gloss itself. Who knows? We might be seeing the comeback of the darker outlining once again! 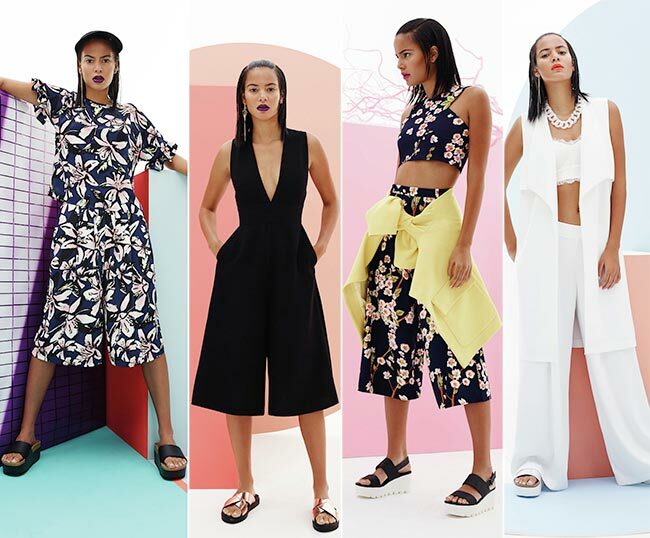 We’re loving that summery look until we get to the footwear. We might want to replace those slipper-looking styles with something more chic and less chunky, especially since we’re in love with the knee length wide leg, the pockets and the deep V plunge of this particular design. We honestly can’t get enough! Flower prints on black fabric, crop top with halter design, knee length wide legged trousers, and a yellow jacket to throw over it all has us rather enchanted. We’re definitely doing much better with the footwear too, combining comfort with style, throwing in the black thick lacing with white platform that is sure to be turning heads. 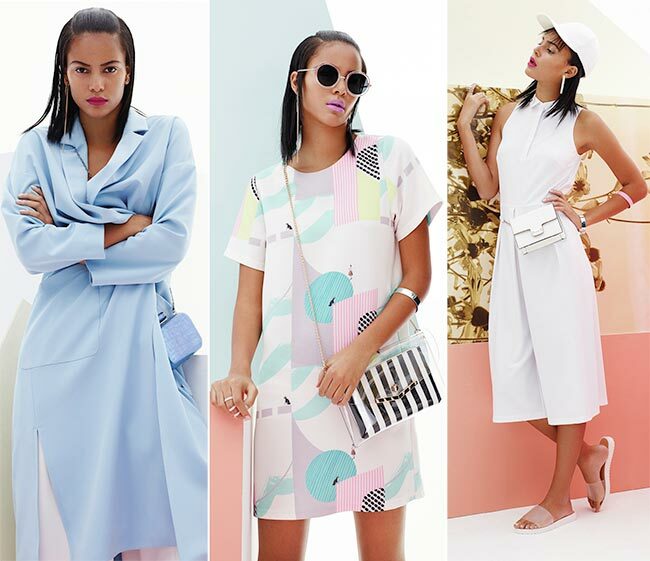 This is a great look and we’re excited to see it in the Primark spring/summer 2015 collection. The white crochet look is possibly our very favourite, the crop top and midi skirt in white lace design, complete with matching white lace flats. It’s the perfect set, with its innocent little girl combined with sultry beach princess look. Baring the midriff for the sun to tan, the body is clad in very little that gives full coverage, but enough to look quite decent at a party. A beach party is probably the best place to wear this one, but it wouldn’t matter where it was worn since we are definitely adding it to our spring/summer 2015 personal wardrobes.